The Laparoscopic Sleeve Gastrectomy is being performed as a primary bariatric operation with increasing frequency. This is the first human study reporting the results of 5 hybrid N.O.T.E.S. trans-vaginal sleeve gastrectomy operations using the new Steerable Flexible Trochar, (SFT), from Ethicon. The SFT was used to provide a stable trans-vaginal access platform for visualization during the performance of the operation and for specimen extraction. This study evaluated the feasability of use and possible benifits to the human subjects including less pain, less abdominal incisions, smaller abdominal incisions, improved ease of specimen removal. shorter length of stay, and shorter time to recovery. Other variables evaluated included length of operation, conversion to open, need for additional trochars, and complication rates for staple line leak, infectionand blood transfusion. 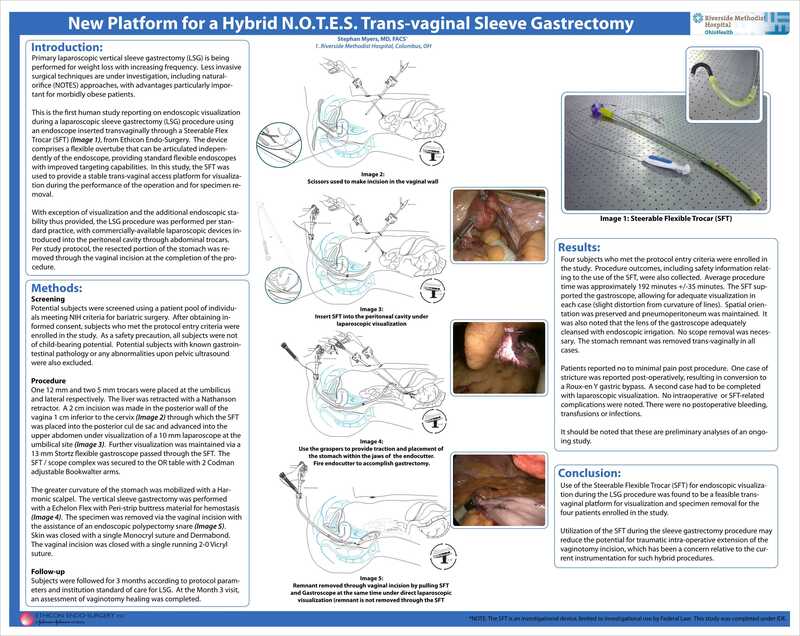 The use of the Steerable Adjustable Trochar from Ethicon was found to be a feasable trans-vaginal platformfor visualization during a hybrid N.O.T.E.S. trans-vaginalsleeve gastrectomy and for specimen extraction.